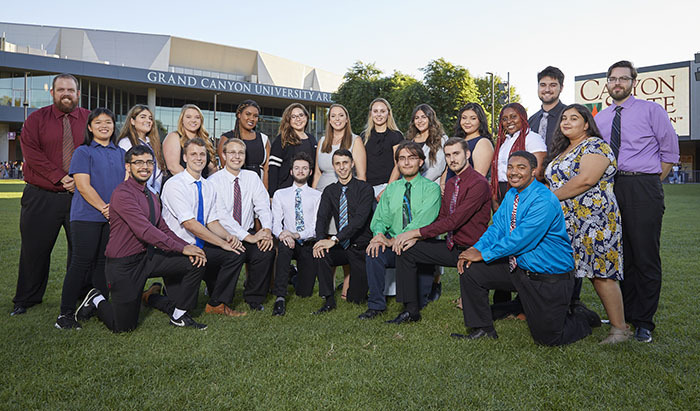 The increasingly popular saying, “Champions are made when no one is watching’’ applies to the recent efforts of Grand Canyon University debaters Matthew Calderwood and Grace Laidlaw and their assistant director, Joshua Vannoy. A relentless summer schedule — lengthy reading sessions, current events quizzes, memorization drills, mock debates and speeches — produced a 10th-place finish (among 49 teams) last weekend at the Georgia B. Bowman Invitational at William Jewell College in Liberty, Mo. Nearly 150 competitors took part in the event, which included Calderwood and Laidlaw’s category: National Parliamentary Debate Association (NDPA)/National Parliamentary Tournament of Excellence (NPTE) style. The pair from the GCU Speech and Debate team won four of their seven matches to advance to the 16-team “out’’ round, where they were eliminated by a pair from the University of California-Berkeley. NDPA/NPTE-style features preparation for a myriad of topics and then maxed-out adrenaline on one topic since the topics – and the assigned stance — are not revealed until 20 minutes before the debate start time. Competitors are not permitted to bring printed materials into the debate room, only handwritten notes. Against a team from the United States Air Force Academy, the Lopes pair successfully argued against the U.S. placing substantial restrictions on use of drones in Syria and Iraq. Against Carleton College of Minnesota, they successfully argued against the U.S. significantly accelerating germline gene modifications. Laidlaw, a senior from Hawaii majoring in exercise science, is known for her devotion to current events. An avid reader, she keeps abreast of national and world news, according to Vannoy. Calderwood’s strength is memorization and speed. “It is a critical skill to be able to quickly and strongly make arguments,’’ Vannoy said, noting that Calderwood is adept at following the four-point refutation: state the issue and stance (claim) of the argument, provide the counter argument (the other sides’ points), provide a warrant (evidence to support claim) and show the impact or importance of being on that side of the issue. In terms of the germline gene modifications, Calderwood said he was not aware of the topic. The team, which is led by College of Humanities and Social Sciences Instructor Michael Dvorak, will be at full strength for the next tournament, Oct. 5-7 at San Diego State University. In his last season on the debate team, Calderwood plans to build off the performance at the Georgia B. Bowman event to surpass last spring’s effort at Lewis and Clark College in Oregon: a top-five national finish at the NDPA event, the best performance in GCU debate team history. Laidlaw and Calderwood developed chemistry and collaboration as partners their first year on the team when they were quieter members, listening and learning from others. Their natural extroversion has completely emerged this year along with their leadership skills — Calderwood is the captain of the debate team, and Laidlaw is the captain of the combined speech and debate teams. After working with other debaters, they have reunited and are a formative pair with a combined 18 years in forensics, including high school. GCU Today: Debate is no laughing matter, but it can be fun too. GCU Today: Speech and Debate team warms to the task again.